So far in this series of blog posts I've talked about setting up the ruida controller and wiring it into the laser cutter, now is the point where it needs to be tested to ensure that it actually works as intended. In the previous post I failed to mention that the power connector needs to be rewired but it's a straight forward swap of GND and +24V. Once the controller can actually be turned on we're ready to start testing. Safety is all important while testing the machine, there are moving parts and laser beams during this whole process so care should be taken. The big red emergency stop on the machine is always close to hand, the key switch similar. 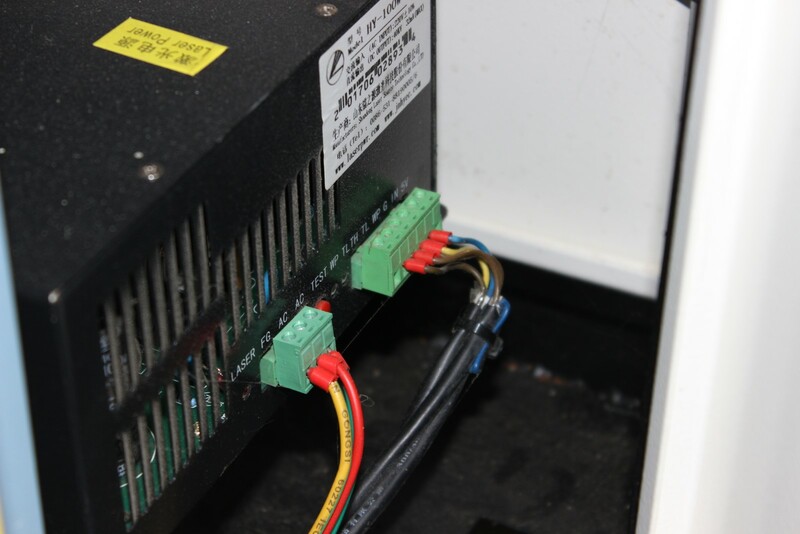 The safety interlock lid switch for the laser is still wired directly to the high voltage power supply so the laser will not fire with the lid open or the water pump off. The first test is to ensure that both axis move in the correct direction. 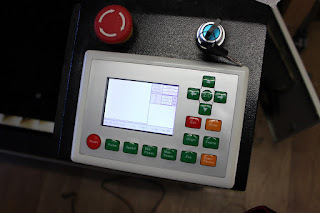 The controller was set up to initialise the X and Y axis to the back right hand corner when the machine is turned on. When the machine is first turned on make sure the X axis is moving to the right and the Y axis is moving to the back, if not then instantly turn the machine off. 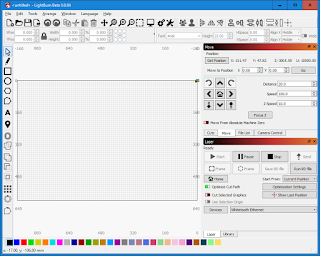 These settings can be adjusted using the 'Direction Polarity' for each axis if need be. The second test is to ensure that the axis stop when they reach the limit switches. 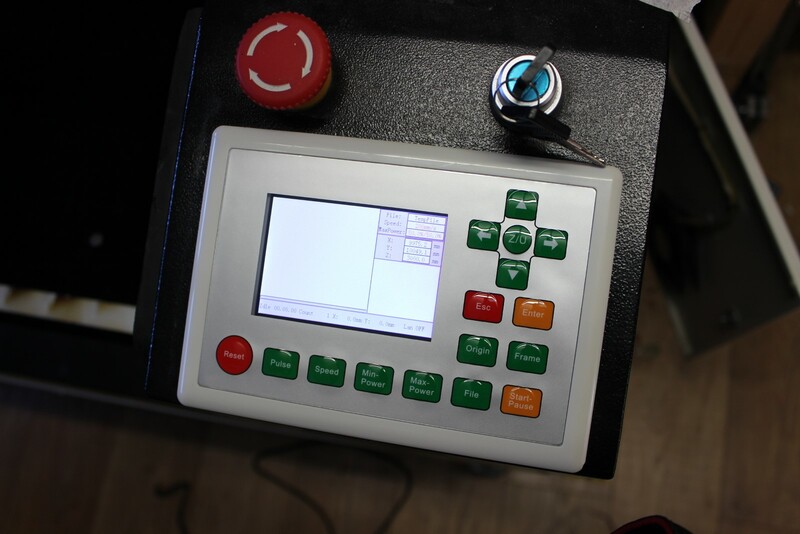 Manually pull the laser head to the bottom right hand corner before turning on the machine, this ensures that the X axis will hit the limit switch before the right axis. When you turn the laser cutter on the head should move to the origin and stop, if the limit switches don't register then the stepper motor will make a horrible grinding noise, simply turn the machine off and investigate. Once the limit switches are working, the machine should datum upon start up. Then you will be able to drive the laser head around using the arrow keys on the keypad. Ensure that the head moves in the right direction according to the arrows. The Z axis doesn't automatically datum, the Just Add Sharks machines only had a limit switch to detect the highest Z point, not an autofocus probe. Press the Z/U button in the middle of the arrow keys to switch the Z mode. Pushing the left arrow should make the bed move upwards and the right arrow should make the Z axis move downwards. That basic testing proves that the Axis are wired correctly and are moving in the appropriate directions. There is one last keypad test that we can do to prove that the laser is going to fire. Put a piece of test material under the laser head and close the lid to engage the safety interlock. When you push the 'Pulse' button on the keypad the laser should fire for as long as you hold the button down. 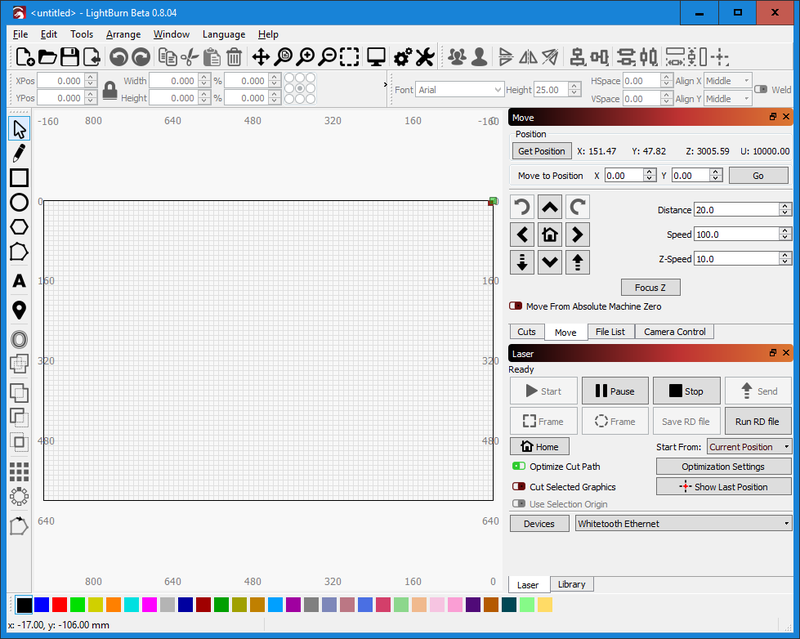 Lightburn has a 'move' tab on the top right hand side that allows you to control the laser cutter from within the program. This panel allows you to specify precise movements of the cutting head which makes testing incredibly simply. 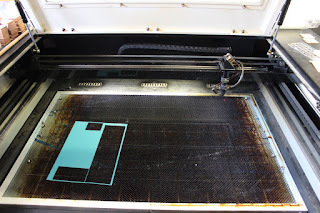 Place a ruler horizontally under the X axis of the laser cutter, align the red dot with 0mm. Set lightburn up to move the head a distance of 20mm, move the cutting head led and check that the dot is now on the 20mm mark of the ruler, simples. 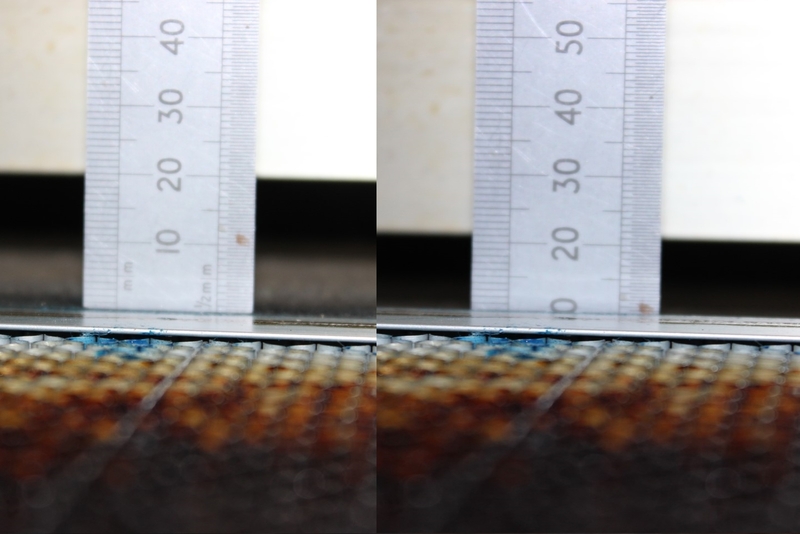 You can repeat this for the Y axis and the Z axis by placing the ruler vertically against a fix point on the laser and moving the bed up along side it. With this testing complete we're able to move on to some proper cutting and files. 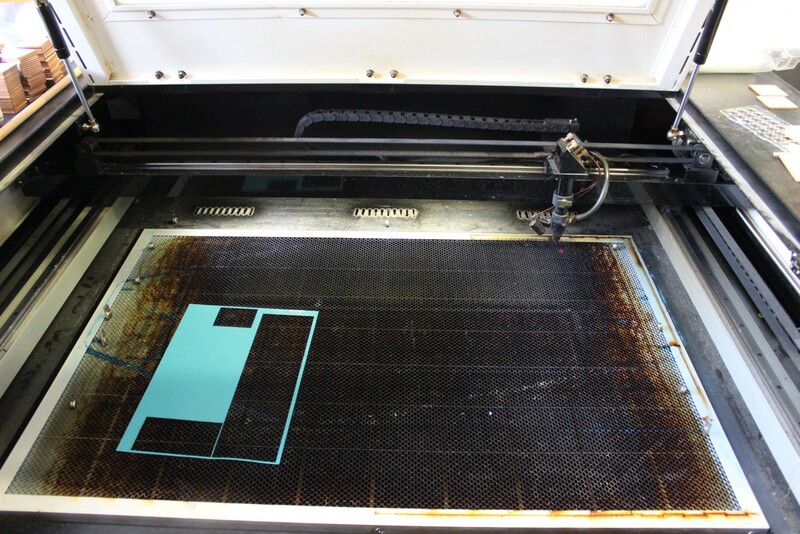 The laser cutter is now ready to run under Lightburn using the new Ruida controller. The next part to this series will detail some of the tweaks and changes required to get back to a fully functional machine, hopefully that won't take quite as long to write up.